One of my favorite parts of working for itch.io is seeing the community use the tools weâ€™ve built in ways we never expected. 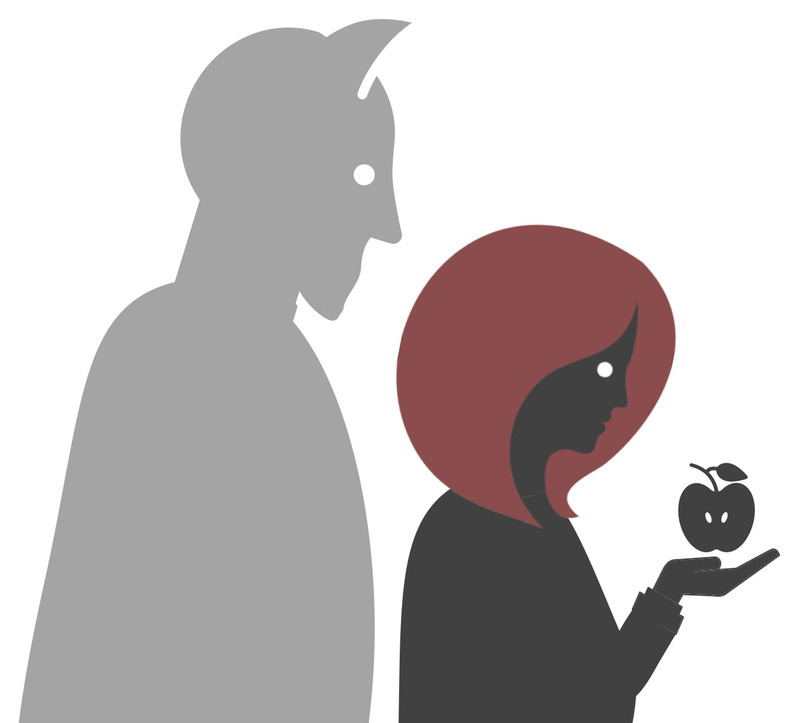 When we first launched itch.io it was a site for games, and it still is… kind of. Fairly quickly after our inception we found artists, musicians, and writers coming using our pages to distribute and sell their content. In the intervening years weâ€™ve kept the concerns of our non-gaming creators in our minds as theyâ€™ve continued to build such a unique community on the site. We want to honor these creators and highlight some of our favorite projects on the site that arenâ€™t digital games. Iâ€™m fairly certain Gigi d.g. is some kind of witch. Thereâ€™s no way any person can contain so much tenderness and communicate it as honestly as Gigi does without having some kind of supernatural help. 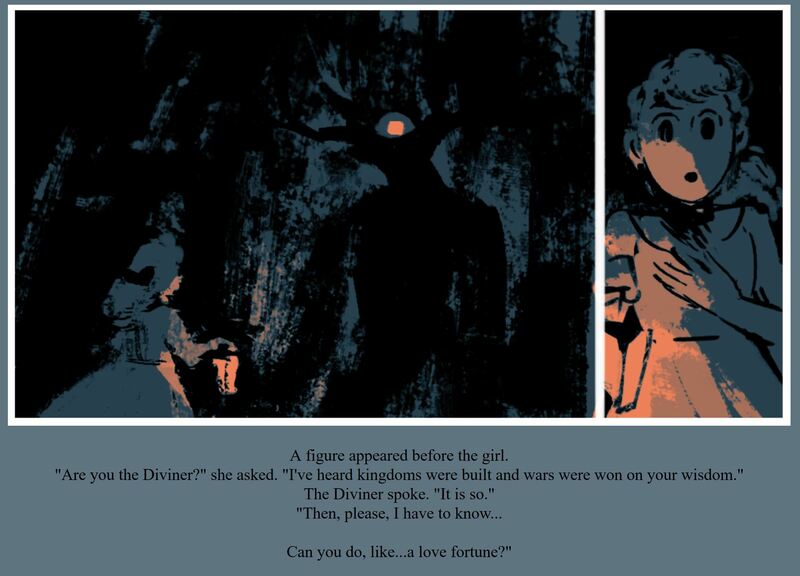 Idle Divination is Gigiâ€™s most recent comic/short story and it features the relationship between a young girl and an eternal fortune-telling demigod. Somehow this setup turns into a heartwarming tale told through 280 character tweets and conveys its unique characters with an intimate and authentic style. I would have liked the story to be longer but thatâ€™s the case with any story you fall in love with. These characters live in a cozy world that feels like it could exist somewhere in our own or one that is significantly better. Idle Divination takes about 10 minutes to read through and is one of the most pleasant experiences youâ€™ll have today. Weâ€™ve mentioned Left before as a part of our interview with its developers Hundred Rabbits. 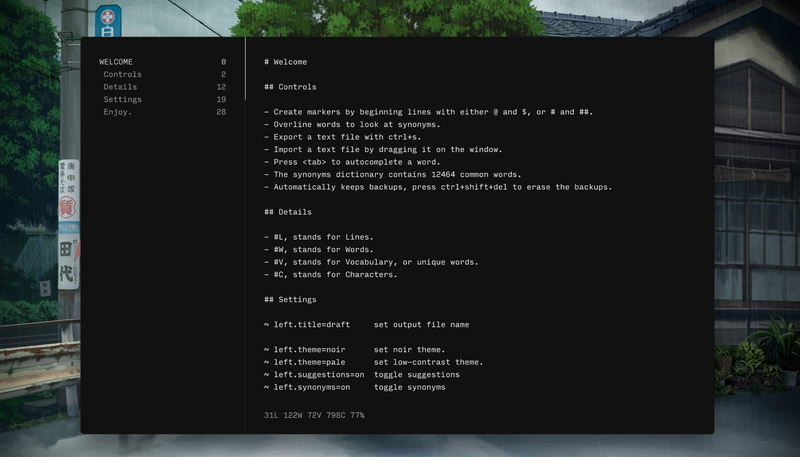 Itâ€™s a brilliant minimal text editor that has everything you need to work on longer projects without getting distracted by all of the bells and whistles of a traditional text editor. There are a handful of quirks that Left brings with it, like exiting to juggle between multiple projects and some peculiar formatting choices. With that in mind itâ€™s become my default editor for my personal projects. Left isnâ€™t an editor for everyone. If you need to do heavy formatting and markups Left will come up short for you. If youâ€™re working on a longer project like a gameâ€™s script youâ€™ll find a clean interface that will allow you to focus exclusively on your work. Iâ€™ve only played Feast at Indiecade, but it was remained in my mind as one of the most unique and intimate experiences Iâ€™ve had all year. I went a bit more in depth when I wrote about Feast in our Favorite games of Indiecade post but the crux is this: Feast is a storytelling RPG where everything is based around eating real-life food that your group has prepared in advance. The game inspired me to think more deeply about what I was eating but also about where that food came from. In the months since I played Feast Iâ€™ve been too scared to try it again for fear of ruining my original glowing experience. I have no reason to think another playthrough would be any less magical -- the rules are the same, and just as tight as they ever were-- but the fear remains. What I have done in the interceding months is recommend Feast to everyone I know who likes food or games, which is to say everyone. Feast is a game that forces you to grapple with it, and by extension, yourself. Itâ€™s a game that oscillates between thinking about your favorite memories of food and thinking about the game youâ€™re playing in the moment. Itâ€™s a fantastic experience and one I hope everyone gets to try. Whoâ€™s ready to read 20 pages of criticism about bathrooms? No please donâ€™t stop reading. I get that this recommendation might be a stretch for some of you, but bear with me. Heterotopias is a zine that collects critical essays on the architecture and geometry of game worlds. 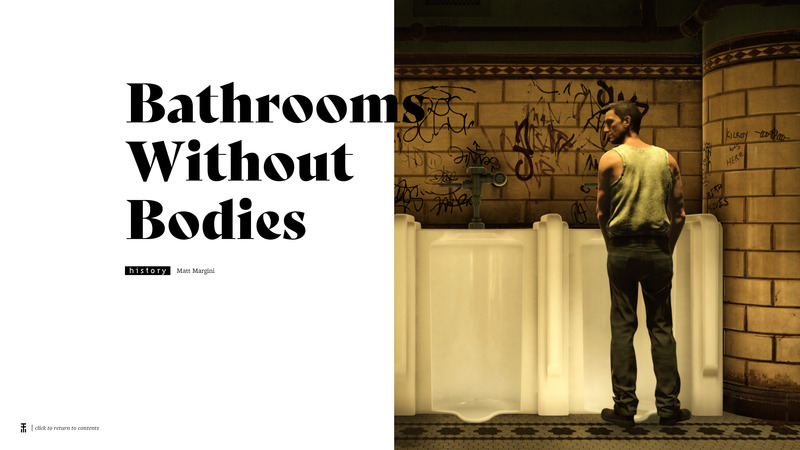 The third installment of the series was released a few months back and includes great thoughts on games like Robert Yangâ€™s Tearoom and Killer7. While I was reading through the zine I realized just how brilliant the criticism was and how talented the contributors were. If youâ€™re at all interested in thought-provoking critical thought on games you can do a lot worse than Heterotopias. Normally this is where a recommendation for a collection of essays would end. We talked about how beautiful the prose is, but that is only half of what Heterotopias is. The other half is the impeccable design of the zine itself. Taking cues from the aesthetics they critique, the Heterotopias design team has crafted a look that is the unlikely combination of both grungy and minimal. Heterotopias is a joy to read and to look at, and has become one of my favorite pieces of criticism this year. And yes, there really is 20 pages of criticism about bathrooms.